Part romance, part detective story, this sumptuous film from Ozon (8 Women, Potiche) is set in 1919 in the aftermath of The Great War, with all its bitterness, grief and prejudice. 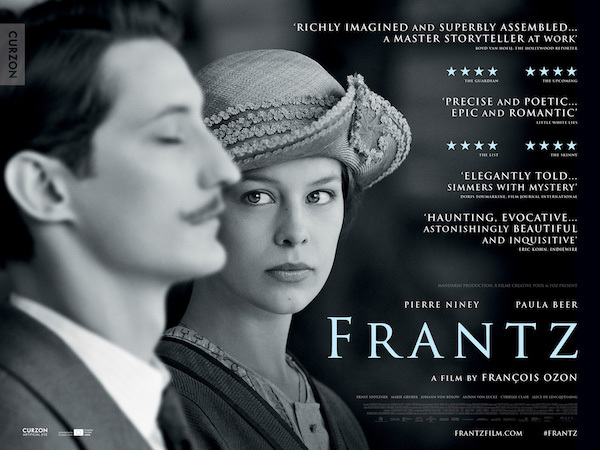 In a small German town, the death of young soldier Frantz is mourned by his parents and fiancée Anna (Paula Beer). When mysterious and charming Frenchman Adrien (Pierre Niney) appears at his graveside, a path to reconciliation opens, leading Anna to Paris and culminating in a gloriously luminous ending. An adaptation (“freely inspired”) from Ernst Lubisch’s 1932 ‘Broken Lullaby’, Frantz is beautifully shot, largely in black and white, with a “stunning” (Guardian) performance from German newcomer Paula Beer. Here is a link to a deeper Review from The Guardian – dating from the film’s debut at the Toronto International Film Festival in 2016. This contains links to both the (TIFF) trailer for ‘Frantz’ and a brief clip from ‘Broken Lullaby’. This Review from The Telegraph is more recent, dating from the film’s UK release, but is similarly deep and analytical, seeing Ozon’s retelling as an homage to Hitchcock’s ‘Vertigo’.